Artist Paints Model Face With Various Beautiful Colors, Close Up. Artist paints model face with various beautiful colors, close up. The master draws in bold lines which remind beak and plumage of beautiful birdie on young girl features. Work is made in blue and violet tones. The Picture is flecked with silvery spangles by smooth motion of the professional. Female patiently waits for the termination of all process to help in creating wonderful seductive attractive and recognizable image. 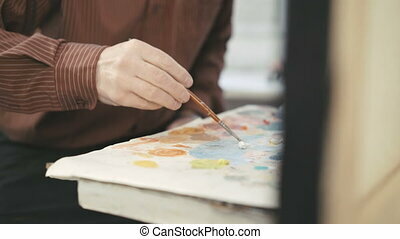 Artist painting with paintbrush (close-up). Beautiful woman close-up smears lips with cream. 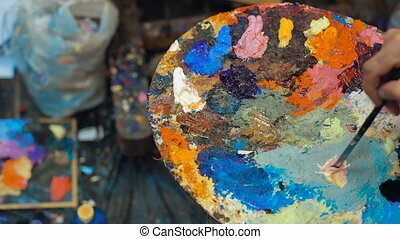 close up of woman artist painting with acrylic paint on a paper in her art studio. makeup artist paints the eyebrows of the model in the Studio, close-up. 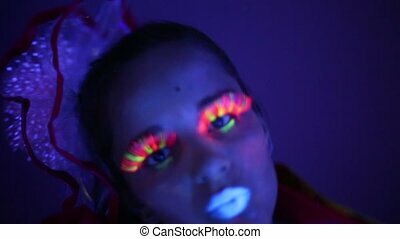 Artist does make-up on young girl, close up, body-art. Stylist draws in bold lines by means of shadows and a brush which remind beak and plumage of beautiful bird on female features. The professional works with accurate confident and neat movements to create bright wonderful and gentle image. Model patiently sits with closed eyes trying not move to prevent destroying and greasing creation of fashion expert which master is already done. Makeup design face frontal in Asian style with a professional artist. 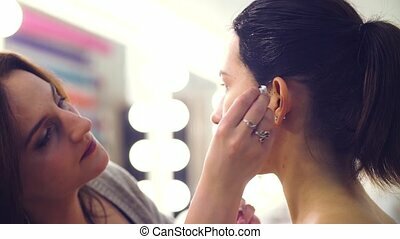 Young designer applies powder with skin tone brush after foundation and concealer applied. There are blue, purple and green eye shadows on models oval face with round cheeks, straight nose and full lips. Young woman is wearing a pale blue and gray Japanese-style dress. Concentrated visagiste with long blonde hair is doing everything fast. Positive miss is watching her movements and smiling. Four women in lingerie talk with each other, photographing backstage. Females smile and laugh entertaining each other waiting for turn to strike pose. Everyone has own special make-up and unique image. Faces are ornamented by various rich colors with spangles and pastes. Blondes and brunettes are wearing in silk dressing gowns or warm scarves over underclothes so they can to start shooting at any time, but not freeze during long expectation. Photographer shoots two models brunette and blonde against white curtains. Women are pair of dark and light angels, their clothes are black, white lingerie. Ladies have wings of large span. Dark-haired girl sits stooping down, during making photos she straightens curly lock of hair to cover up left side of face. In background we see chair with cloth near girl in glasses, which swaps shoes. At end of video operator enters frame, explains to bints how to change position. 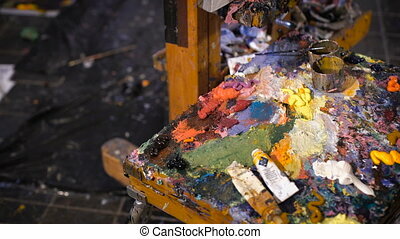 Woman sits in front of visagiste, process of makeup. 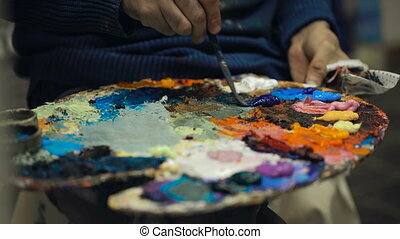 Beautician works with large palette of eyeshadows, mostly cold tones, applies blue and green hues. Model smiles, looks away sometimes. She is in a light blue blouse or dress with flowers. Her dark hair are collected into high bun in the style of a Japanese geisha. We see only hands with silver ring with big ball and pale reddish hair of visagist. Women sit in front of large French windows in evening or night. Close-up of female artist draws a line on face of the model. Stylish make-up artist creates an image on a woman using a cosmetic pencil. 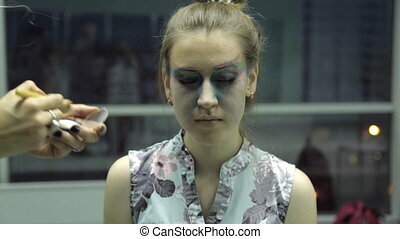 On model face make-up artist applies orange shadows to eyelids. Hand of master with help of a brush imparts a cosmetic product on closed eyes. Close-up of woman laying hair and make-up on her face with brush. Make-up artist applies a foundation on chin of beautiful female model, in which large red curls hang. Beautiful artist paints make-up to young girl in front of the mirror. Stylist is verified with the sketch on her mobile phone and puts drawing on female face by means of brush and shadows. The master smiles and talks to client during all process to relieve tension and create good mood. Model has coiffure with raised hair in form of bunch so that it did not prevent to the professional work. 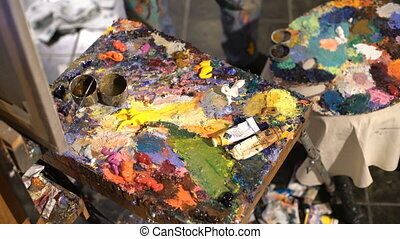 It will help to create an image with professional excellence accuracy and inspiration. Close up view of female model making up. Young woman is sitting and waiting for photo shoot starting with visage putting cosmetic tools on face skin. 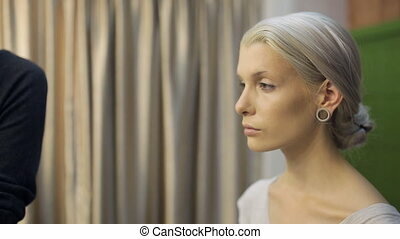 Female has beautiful and right face features straight nose and full lips painted with natural colors, white hair done in bun and big ear tunnel. 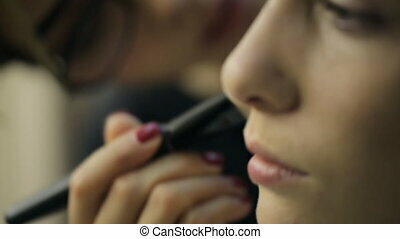 Professional worker is using finger putting eye shadow, powder, blusher, foundation, and other cosmetics. Woman has well-groomed hands with red colored manicure. 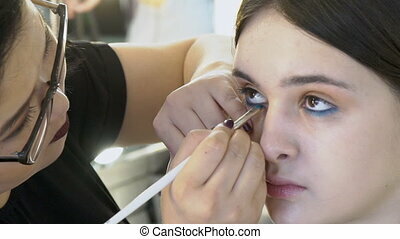 Close up view of woman model getting make up. Visagist is putting cosmetical tools on face skin of young model sitting and waiting for photo shoot starting. Professional worker is using brush putting powder, blusher, foundation, eyeshadows and other cosmetics. Female has beautiful and right face features straight nose and full lips painted with natural colors. Unfocused working woman has short brown hair and well-groomed hands with red colored manicure. 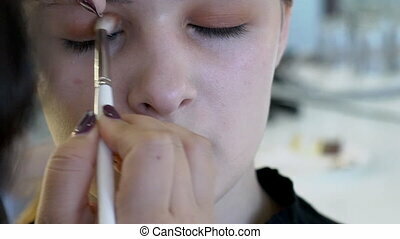 Asian visage artist is doing make-up for young female model in studio, close up. Brunette lady with brown eyes is sitting and the master in glasses is applying blue eyeshadows to the lower lid by the white brush in her hand. 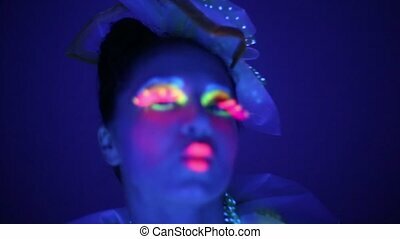 Close up view of model getting ready for photo shoot. 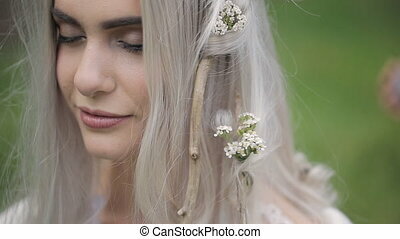 Professional stylist is working with plants, branches and flowers putting it in long loose grey or white hair of young beautiful woman standing outside preparing her for taking pictures. Female has right face features painted with natural colors. Creative project has interesting concept and idea inspirited of wood, trees and nature in connection with people making friends, existing together and being careful and caring towards environment. 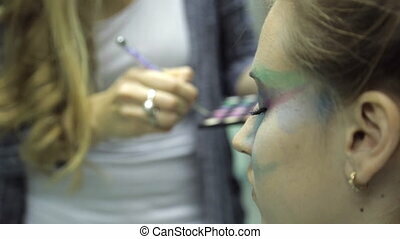 Close up view of female getting ready model for photo shoot. 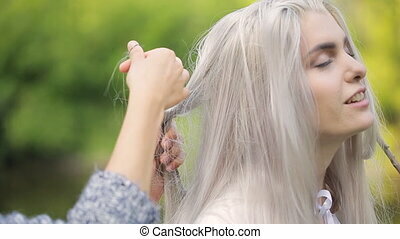 Worker is putting branches in female white long loose hair. Creative project has interesting concept and idea inspirited of wood, trees and nature in connection with people making friends, existing together and being careful and caring towards environment. Standing outside she is preparing young and beautiful woman for taking picture. Female has right face features painted with natural colors and tattoo on right arm. 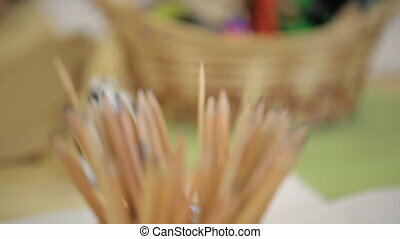 Close-up view of pot with pencils for drawing. 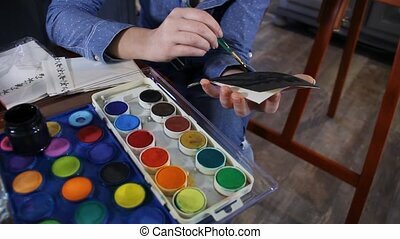 Stationary is in long usage of artist creating black and white pictures, portraits of different aged people, still life compositions and artistic projects. Made of wood pencils are good for graphic works of various styles and sketches. Some are sharp others with worn lead. There are napkins of green color papers for painting and wicker basket with colorful chalks and crayons prepared for students studying and learning. Close up image of young female sitting in model school. It is backstage of fashionable model school show where girls are discussing work done preparing for next or getting ready to finish. Making up, getting nails ready for manicure beautiful woman is talking to friends smiling and laughing. She is wearing long loose straight dark hair and classic or casual blouse with pattern of flowers of white, red and blue colors. Her skin is cleaned and well-groomed. 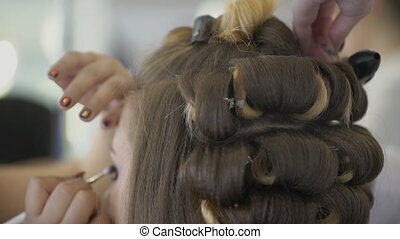 Woman with large curlers stylist does make-up on her face with brush. Close-up on brunette hair do a hairdresser styling and works simultaneously as a make-up artist. Close up of young female model is being maked up by visagist in studio. 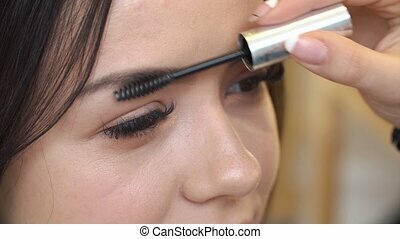 Professional is applying colour to lower lid of the right eye of young beautiful lady, using blue liner, which artist is holding in hands with nice manicure. Close up view of woman making manicure in model school. Having break of fashion show young beautiful females are sitting at table talking and preparing for defile, walking on runway or photo shoot. Girls are discussing work done smiling and laughing getting nails ready for manicure with nail file concentrated and moving carefully. She is wearing long lose dark hair, massive steel sparkling necklace, black t-shirt and same colored leather jacket.